Active filters can be used to limit the range of frequencies that may be passed to an amplifier. Filters can be designed to pass high frequencies, low frequencies, or a range of middle frequencies. 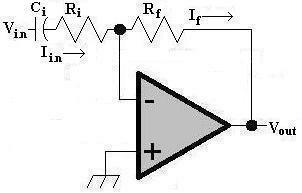 Filters can be designed utilizing op-amps in an inverting amplifier configuration. Cutoff Frequency: The frequency fc where the filter output voltage falls to 70.7% of its peak output. This is equivalent to 50% (-3dB) of the peak power output. 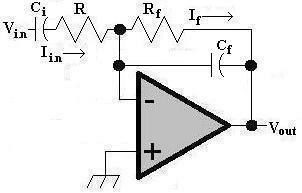 Low Pass Filter: Attenuates signals with frequencies above Fc. High Pass Filter: Attenuates signals with frequencies below Fc. 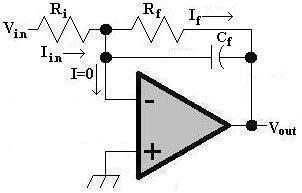 Band-Pass Filter: Attenuates signals with frequencies outside of a range of frequencies (passband). Q: The ratio of a Band-Pass Filter's center frequency to the bandwith of its passband. A higher "Q" indicates a narrow passband for a given center frequency. Roll-Off: The gradual reduction in signal amplitude beyond a Fc. Xc = 1 / ( 2 * π * fc ). For fc = 300 Hz and Ri = 10 kΩ, Ci = 1 / ( 2 * π * 300 * 10000 ) = 53 nF. The impedance of the feedback signal decreases, resulting in a lower voltage drop across Rf and Cf. Because RF, Cf, and R form a voltage divider, Vi increases. This means that less output voltage is required to balance the input current at higher frequencies. For fc = 3 kHz and Ri = 10 kΩ, Ci = 1 / ( 2 * π * 3000 * 10000 ) = 5.3 nF. 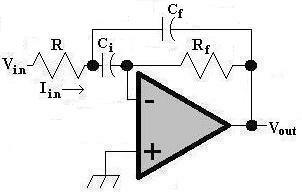 A simple band-pass filter is constructed by add Cf and Ci. The values of Ci and Cf are calculated as if the band-pass filter was separate high pass and low pass filters. A steeper roll-off and a high "Q" can be achieved utilizing multiple feedback paths. This is simply achieved by rearranging the capacitors Ci and Cf.